Truthfully, I do not write about the wonderful game of doubles enough in this column. I have recently received questions from readers addressing this "other" game. So, I am going to attempt to make up for "lost time" by dedicating this month's column to the basics of playing doubles. First, it should be noted that singles players can greatly benefit by playing doubles. Not only does doubles require more net game, it has less side to side motion than singles. Singles players will find that their overall court movement will improve by playing doubles. Doubles is a great way of increasing your on court skills and stamina as a replacement for formal practice sessions. John McEnroe was at one point ranked one in singles and doubles. I believe that he used doubles competition to replace some of the practice sessions in which he would normally have to engage. He kept his strokes honed, and improved his physical conditioning by playing doubles. Still, doubles is a different game than singles. It is important to recognize some of the obvious, but important differences. First and foremost, doubles is a game of placement and control. The modern game of singles has become very much dependent upon power... particularly with respect to groundstrokes and serves. Big serves have their place in doubles, but groundstrokes need to be placed more carefully, and as such, they are probably hit with a bit less pace. Second, the team that controls the net in doubles is most likely to win the point! In singles, net play is less common in the modern game, and passing shots can make even the accomplished volleyer timid when competing in singles. The goal in doubles is to get both players at the net and in positions where they are able to volley effectively. It is not surprising when watching the pros to see all four players (both teams) at the net trading volleys with each other in a rapid fire manner. Indeed, I find these situations to be very exciting to watch, and to play! Third, doubles is a game of communication and understanding between partners! The more you play doubles with a particular partner, the more likely each of you know what the other is likely to do in any given situation. Good doubles teams have great communications between players. Good doubles teams recognize that each player is integral to success. I have seen quite a few doubles matches among collegiate and recreational players where one player takes control and literally tries to hit virtually every shot for the "team." This team consciousness is not something that is found in playing singles. Sharing the court, the shots, the successes and the failures is all part of what makes doubles such a unique form of tennis. If you can find the right partner, doubles will become a joy for you and you will relish every opportunity to play this great game. Without the right partner, doubles can be a nightmare and excruciatingly tedious to play. Finally, the increased space in doubles presents a very different court. The alleys offer new spaces to place shots, and allow for more severe angles. However, there are two players on each side of the net. So, the spatial aspect of doubles is again different from singles. Having said all of this, there are some basic aspects of doubles that are fundamental to playing the game successfully. In doubles, you clearly want to be moving in tandem with your partner. If she/he moves left to hit a reply, you want to shade your movement in the same direction. If you or your partner are forced to move back to hit a lob thrown up by one of your opponents, the other should move back as well. If you were to attach a rope around each player's waist that connected the two together, you would automatically be moving in sync with each other. I like to use this image to instruct players on how they should approach court movement when competing in doubles. Doubles is a game that requires each player to be on his/her toes at almost all times. In singles, you may have to run hard and "flatfooted" to get to a ball. This occurs less frequently in doubles. One player is at the net and should be on his/her toes. The other is trying to make it to the net or has secured a position adjacent to his/her partner. Forward movement and net play require smaller steps and demand that the player be on his/her toes in order to move quickly in any direction and reply with a volley. When all four players are at the net and the volleys are rapid fire, each player must move quickly and reflexively to hit a reply. The time that one has to setup in these situations is no time at all! Either you react to the ball quickly and hit your volley, or you don't. Being on your toes does help to assure that you do make the proper volley response. Formations in doubles are critically important. All too often, I watch recreational doubles where one player is back at the baseline and her/his partner is at the net. This is a most disadvantageous combination! Sometimes, this "formation" cannot be avoided. But, it is inherently leaving a team vulnerable to the baseline player tracking down lobs, and the net person being fed a hard shot that usually is placed at her/his feet. 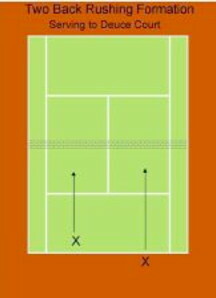 Finally, this one up/one back formation leaves the court open for opponents to hit volleys that are at an angle that prevents either team member from being able to make an effective reply. My guess is that this formation is so common because many players are not comfortable at the net. They lack confidence in their volleys and/or have difficulty approaching the net effectively. Even if this is the case, face your fears and get to the net. Yes, you will probably make some errors. But eventually, you will learn to hit approach shots and strike volleys in effective manners. The addition of these to your arsenal of weapons will help you in your singles game... especially on faster surfaces. The classic formation for serving in doubles is for one player to be at the net. The other partner is serving and immediately moves to close the net. This serve and volley is the norm in doubles. If done effectively, both players will eventually end up at the net, which is where they want to be when competing in doubles. Below are images of the classic doubles serving formation as played on both the ad and deuce sides of the court. The arrows show the movement of each player, not the ball's movement. Not surprisingly, the classic formation for receiving serve in doubles is exactly the same. The person returning serve seeks to chip the ball back and then close the net. Here again if done effectively, both players end up at the net. When returning serve in doubles, the best play is to hit your return low to the net at the feet of the on-coming server. If the return is too high, the opposing team's net player will poach and put the return away for a winner. To return with power and topspin will only allow the server to hit an easy approach shot. Again, doubles is a game more about control than power. If you notice that the opposing team's net player is standing too close to the net as her/his partner serves, you can lob a return over this net player's head. This will force the charging server to stop his/her forward movement and make a reply off of your lob. Usually, this means that both opponents will be brought back deep in their court, allowing your team to gain control of the net. Or try to hit a shot that is hit down the line and into the double's alley. In that the net player is close to the net, her/his reaction time to volley is shortened, and sometimes this allows for a clean winner off the return of serve. It is usually not productive to try and hit your return directly at the opposing team's net player. She/he will often times hit a block volley that just dribbles into your court for a winner, or she/he will volley directly at your partner who is at the net. Either is not likely to result in your team winning the point. I would suggest that 90% of your returns be directed cross court at the server's feet. 5% of the time, lob your return over the head of the opposing team's net player, and 5% of the time hit your return down the line into the double's alley. If you are not really comfortable as a team at the net and/or the opposing team's server has a really big serve, you may want to adopt the stay back formation on the first serve. Below, are diagrams that illustrate this formation. If you adopt this receiving formation the idea is for both players to move forward to the net after the receiver has made his/her return. 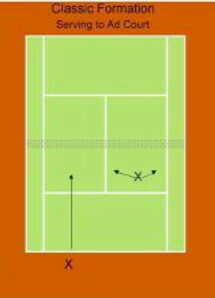 For singles players who are not natural doubles players, this receiving formation can be very useful in that it keeps both players in more comfortable territory. On the second serve, which is usually not as powerful, the receiving team should revert to the classic one up/one back receiving formation. I have seen this two back formation work successfully when a team is serving. The server and her/his partner move together toward the net after the serve is struck. Again, this formation may be more comfortable for singles players who are not accustomed to playing doubles. Still, the ultimate goal is for both players to get to the net and control it. Sometimes, a change of formation is needed. This is especially true when the classic formation is not working and/or when your opponents seem to be poaching frequently and successfully. When this occurs and your team is serving, I recommend the "I" formation. 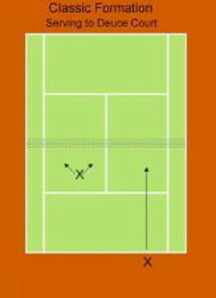 Essentially, the serve stands near the hash mark in the center of the court whether serving to the deuce or ad side. Her/his net partner is crouched low and she/he is standing on the center service line. The server moves in one direction after the serve, and the net partner moves in the opposite direction. Below is a diagram that illustrates the "I" formation. This formation leads me to the essential aspect of proper communications between team players. Before serving in the "I" formation, the two partners decide in advance in which direction each will move. I have seen teams that have been losing a match come back and win by simply adopting this formation when serving. If nothing else, it can confuse your opponents and unsettle their rhythm/momentum. Where is the server attempting to place his/her serve? Will the net player attempt to poach on the return of serve from the opposing team? Being on the same page with respect to these two questions is absolutely fundamental when serving in doubles. Hit more frequently to the player who is weaker on the opposing team. Deep player should hit to deep player and net player should hit to net player. This "rule" holds true even when all four players are at the net. In this latter situation, the idea is to keep hitting at one of the opposing team's players as forcefully and directly as is possible. Should you be able to do so, keep these latter volleys as low as possible... preferably at the feet of your opponents. Never poach when the ball is below the height of the net as you make contact. Never poach when the ball is coming with significant pace. Rather, poach when the ball is at a reasonable pace and is above the height of the net when you make contact. Poaching balls at shoulder height when you make contact is ideal! The best places to hit your volleys are at the feet of an opponent or hit them down the middle of the court between your two opponents. This latter volley technique is sometimes referred to as the "center theory of doubles." Essentially anytime a ball is hit between your two opponents, there is a greater likelihood that each will delay a fraction of a second. Thus, their shots are less likely to be well struck and well directed. When you are the net person for the serving team, keep your eyes on the returner's racquet face and really try to see the ball come off the strings. Don't look to see if the serve has landed in the opponent's service box. Even if it is out, there are two people on the other side of the net who can call it in. If they do, there is little that you can do with respect to protest. As always if you really believe a team is cheating you on calls, ask for a line judge from the tournament sponsor. If it is recreational play, you will just have to hope that your opponents are honest and will live up to the "code." More often than not, slice is preferred over topspin in doubles. The idea is to keep all your shots bouncing low in the hope of getting a sitter that either your partner or you can put away. Remember that the rules of tennis allow you to change receiving courts from set to set. Let's say that you are in the deuce court when returning serve for your team. If you have a disastrous, losing set, you and your partner can change sides when there is a change of set. So in the second set, you may be receiving serve in the ad court without breaking any rules. However, you cannot change sides during a set. Hopefully as we get closer to the end of outdoor play (those of us north of the Equator), more of us will be out there playing doubles. Doubles is a much more cerebral form of tennis. It develops skills that have frequently not been sufficiently addressed by singles players. During the off season, one can find leagues that sponsor doubles competition. If you are paying for indoor court time this winter, doubles allows the expense to be shared by four instead of just two people. Most important, doubles is a wonderful part of this great game of ours. Although singles competition gets most of the attention from the media, the Bryan Brothers (like the Woodies before them) have done a great job in keeping this great form of our sport in the limelight. So, get out there and play some doubles. Learn the fundamentals of doubles and find yourself a compatible partner. I am sure that if you do that in no time you will become a tennis overdog!